The stresses of life can weigh down our naturally buoyant spirits. Authentic self-expression and exploration through activities together can help us form a connection to our deep selves, where creativity, optimism, self-compassion, joy, and laughter naturally grow. Without requiring or promoting any particular religious dogma, workshops integrate ancient Eastern practices with modern psychology for a uniquely inspiring experience! If you are seeking a transformational workshop experience for a group to enhance programming within a yoga studio setting, community-based nonprofit location, or for a work team within a business, please contact me! I can design a package to suit your needs and culture, promoting wellness and improved sense of connection and purpose for your community. 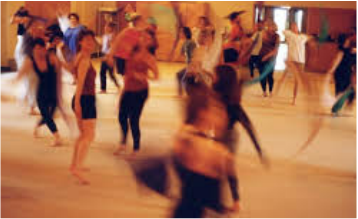 "YogaDance by Donation: Let Your Spirit Dance"
The typical class includes stretching on the mat; dancing to exuberant, heart-pumping rhythms; and participating in relaxation/meditation. Connect with tribal wisdom throughout the class by joining in the circle of community, and by mirroring and sharing in the movement of others. Kripalu YogaDance is not a competitive exercise, or a dance of "right steps." Instead, you are encouraged and supported to respect your personal body limits, modifying any movement as needed to make the dance your own. Movement suggestions may include specific yoga postures set into motion as well as visual images or dance games to inspire movement. We may wiggle in Goddess pose to Aretha Franklin, become lions on the prowl to African music, or glide around the room like flocks of birds. Experience Positive Psychology, embodied. Traditionally, the dance is done in bare feet. Please wear comfortable clothes that are easy to move in. We will use yoga mats (usually provided by the studio), and it’s good to have a bottle of water on hand. Most importantly, come with an open mind and heart, ready to celebrate your whole self in community! Copyright 2016, Chris Chance, Ph.D.